I would be grateful for any information on the mark and the origin of this item. The mark to the left modern simplified Chinese characters for pure silver. 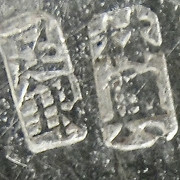 The Chinese word "pure"when used as a precious metal mark, indicates a metal fineness that, up until 2015, was 995 or higher, but which has since legally been reduced to 990. The actual Chinese character for pure also translates as meaning ample, enough, or sufficient. How the meaning translates in Chinese depends on how the character is used in conjunction with the characters for a precious metal such as gold or silver. It is in these combinations that the translation becomes "pure"gold or pure silver. Thank you Peter for the informative comment. I suppose the other mark is that of the maker or the retailer. But I would also like to point out that this statue isn't really "Chinese" - it's definitely a Thai work! (at least in style). 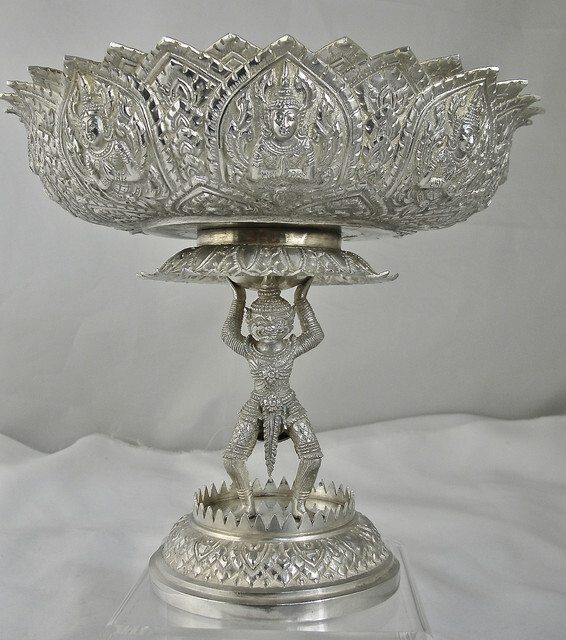 Most probably it was done by a Thai Chinese and hence the Chinese imprints. In this aspect, the two characters "纯银" (Pure Silver) here may not officially indicate it's either 990 or 995, as it would in China. Safe to assume 925 for this one. Welcome to the forum. Thanks for your contribution with extra information. Much appreciated. Yes, I would agree, the origination is either Thailand, Laos, or Cambodia, in that order. Very common for the mostly-Chinese makers in those countries, at least the bigger ones, to stamp their wares with the Chinese characters for their business name, and often some other marks in the local language/script for purity and weight. That is a very nice piece!